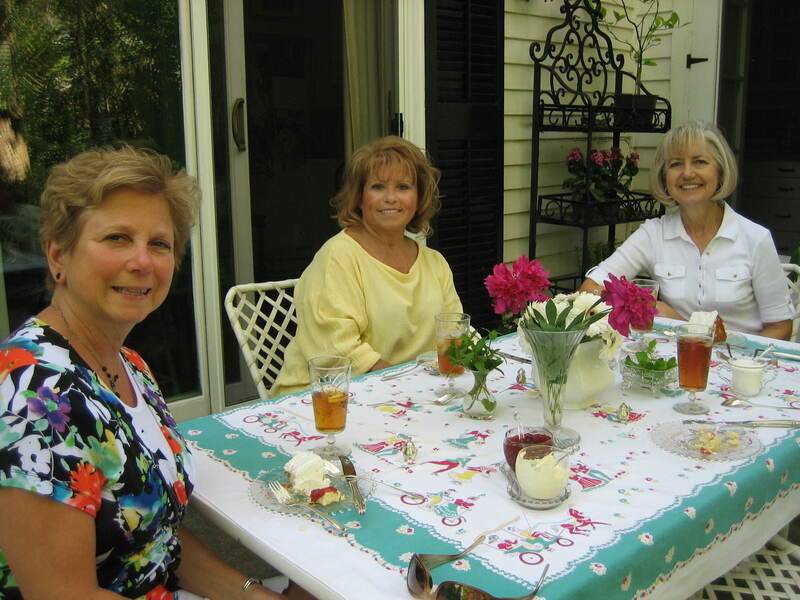 I don’t know what I love more – afternoon tea, a beautiful day outside near the garden, or getting together with friends. 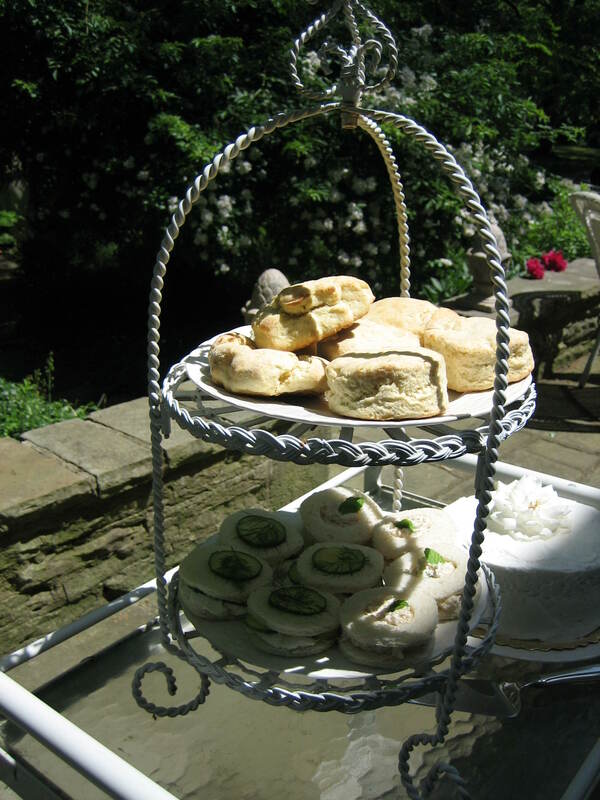 Well, this day I was enjoying all three of these things at once for I was serving tea to some of my friends on the patio with my garden in full view. 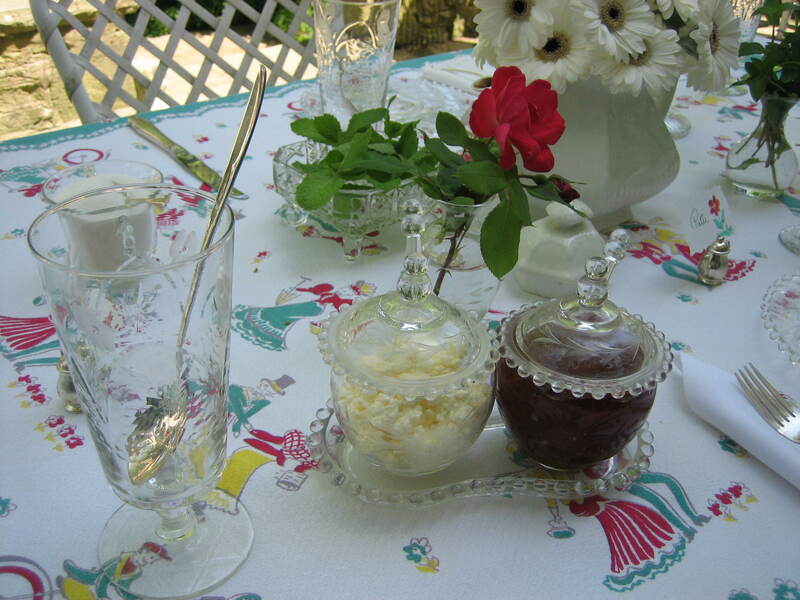 I suppose I like the idea of afternoon tea so much because it’s such a gracious old world pleasure and I find old world pleasures delightful. They help in offsetting the stress and pressures of modern life. 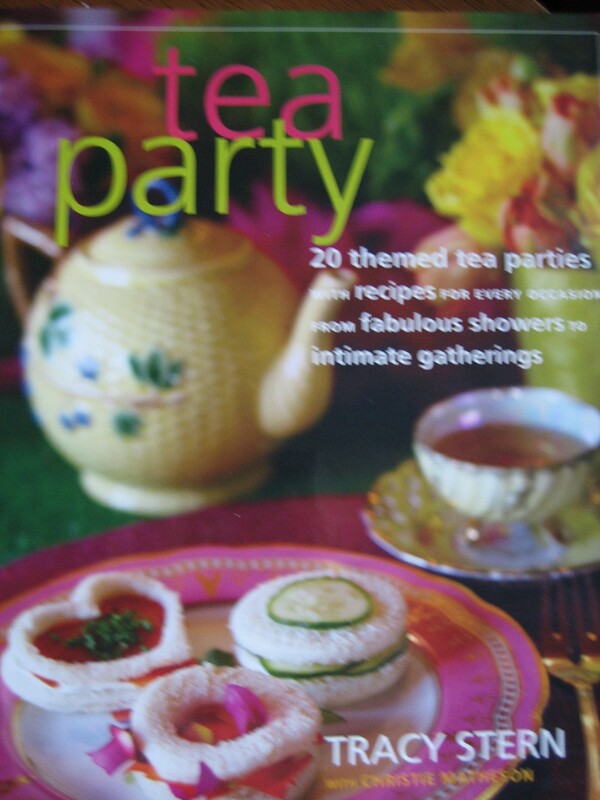 So I pulled out one of my many tea books for inspiration – this one is called Tea Party by Tracy Stern, and I got to work. 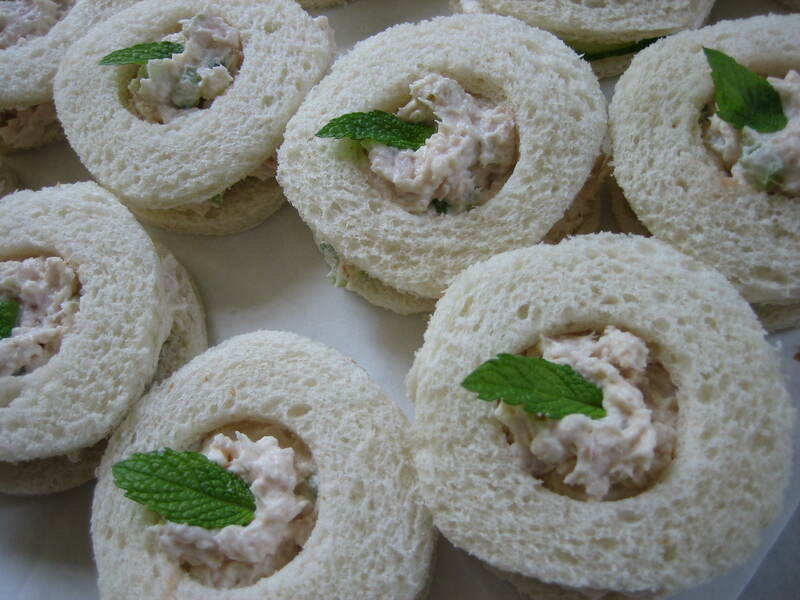 then to insert a chicken salad mixture and decorate each tea sandwich with a sprig of mint from the garden. 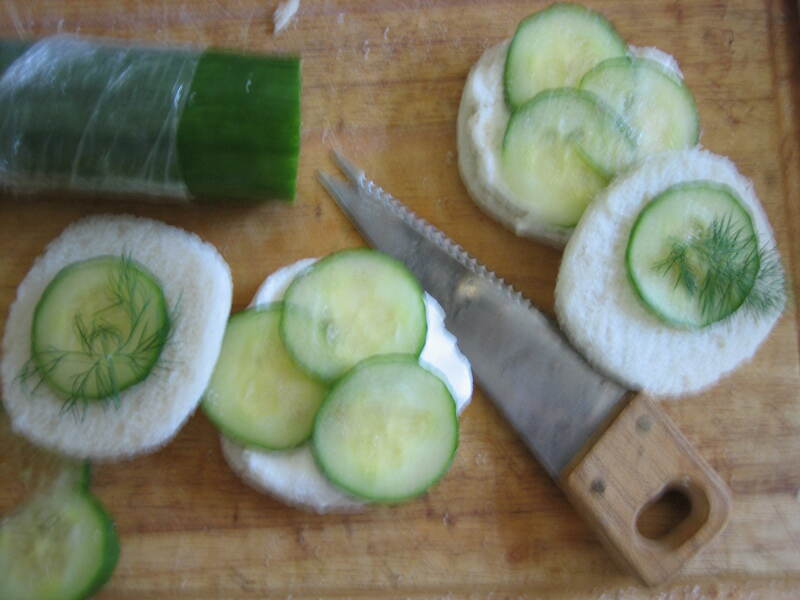 a little cream cheese, salt, white pepper, thinly sliced cucumbers and a sprig of fresh dill, and another sandwich was complete. 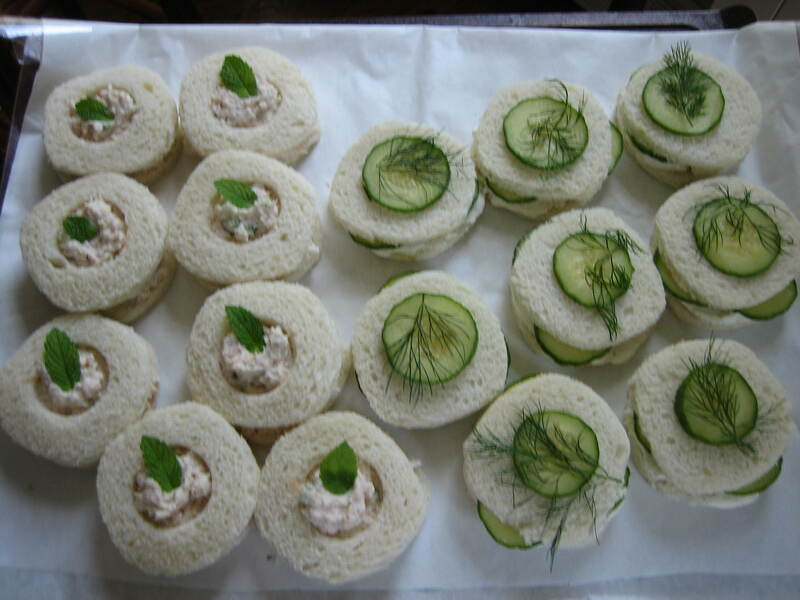 The sandwiches were placed on a tray, covered with a damp tea towel, and were placed in the fridge where they would stay fresh until my guests arrived. That was easy, wasn’t it, and it didn’t take much time at all. 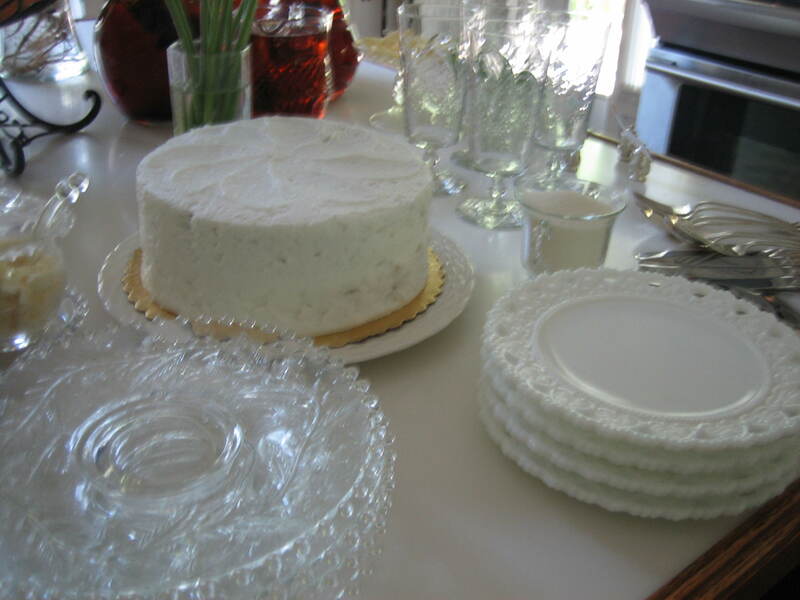 So I had scones and tea sandwiches and also a cake which was purchased – something savory and something sweet for my guests to enjoy. 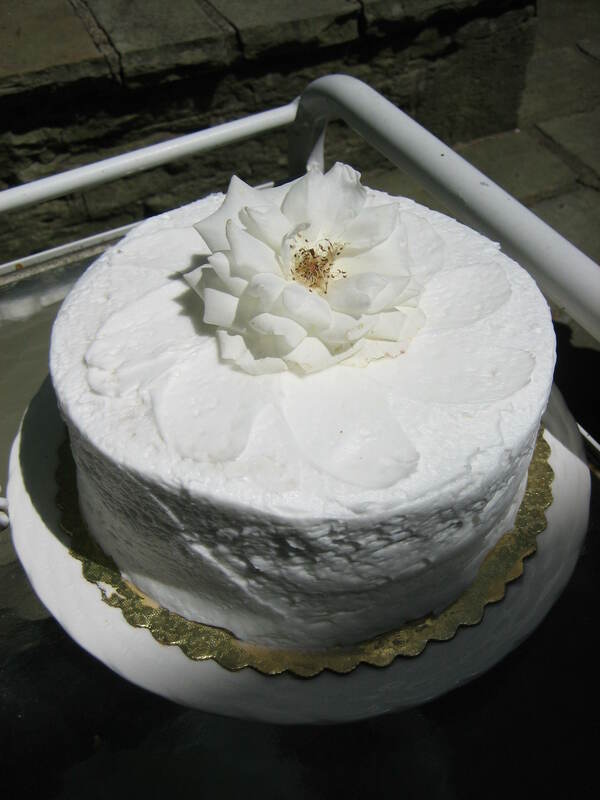 My only contribution to this cake was the flower from my garden which I placed on top of it. There’s really so little work involved in having guests in for tea I wonder why more people don’t enjoy this celebration more often. 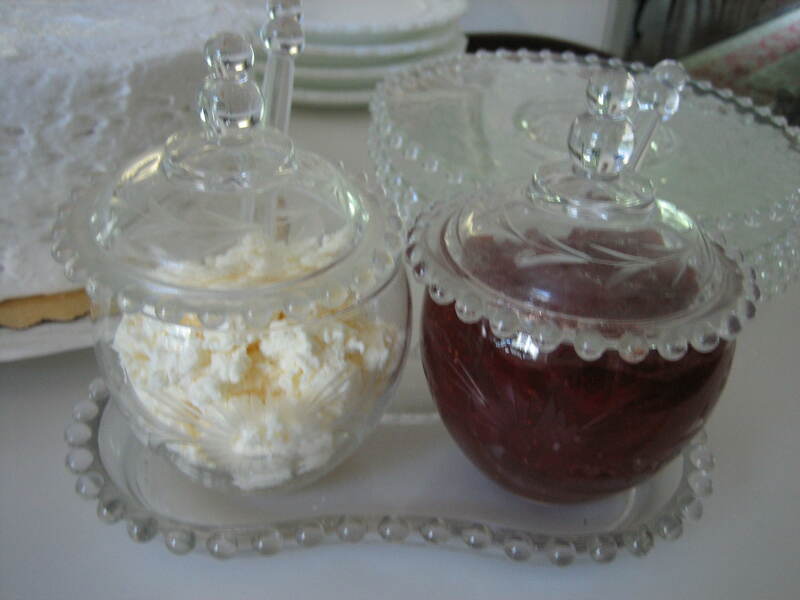 If a person feels like going all out they can prepare elaborate hot food for their tea and call it a high tea. If they feel like taking it quite easy, they can serve only cinnamon toast or bread and butter as certain characters in Agatha Christie’s “Miss Marple” stories do. As in the Art of Letter Writing there are no hard and fast rules. The Art of Tea allows us to do our own thing – all sorts of our own things. 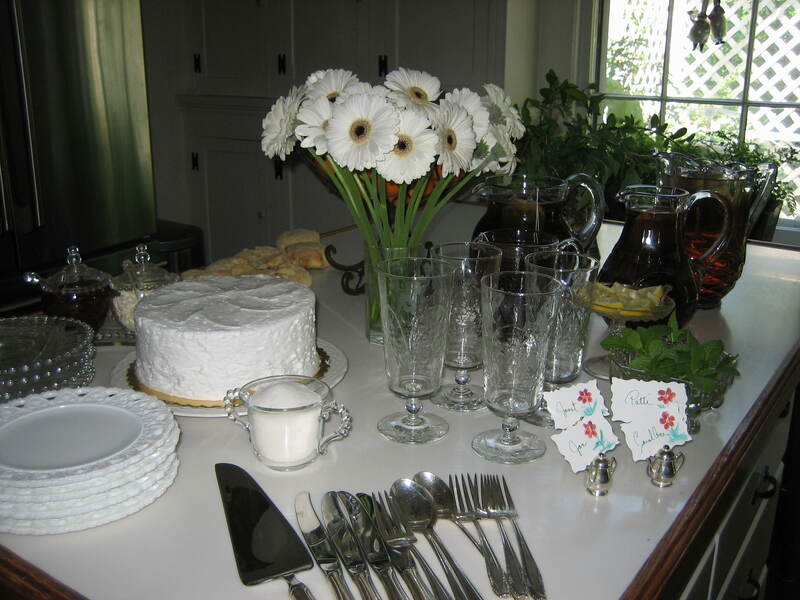 I set everything out on the counter in my kitchen, so everything would be ready, just to be carried out to the patio at tea time, and then I could relax and anticipate a fun afternoon doing other things till my guests arrived. 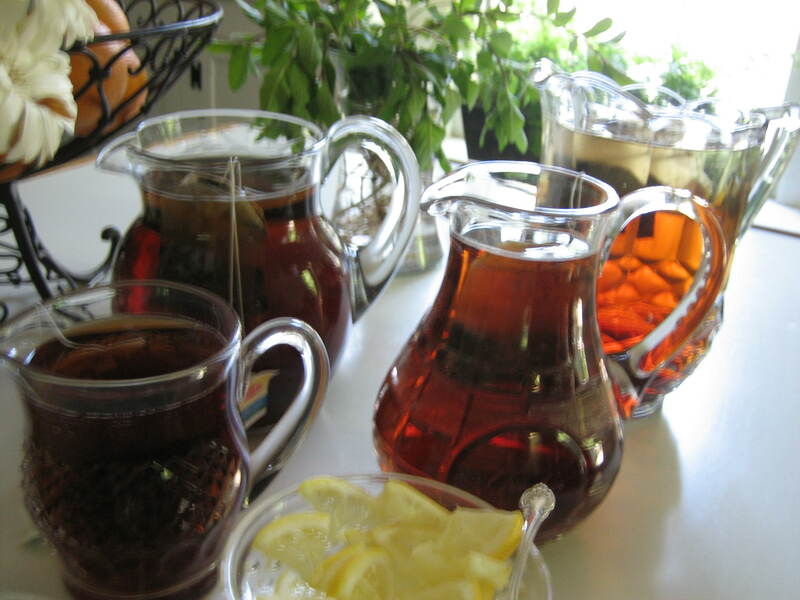 and of course the tea, plenty of tea, ready for ice cubes. 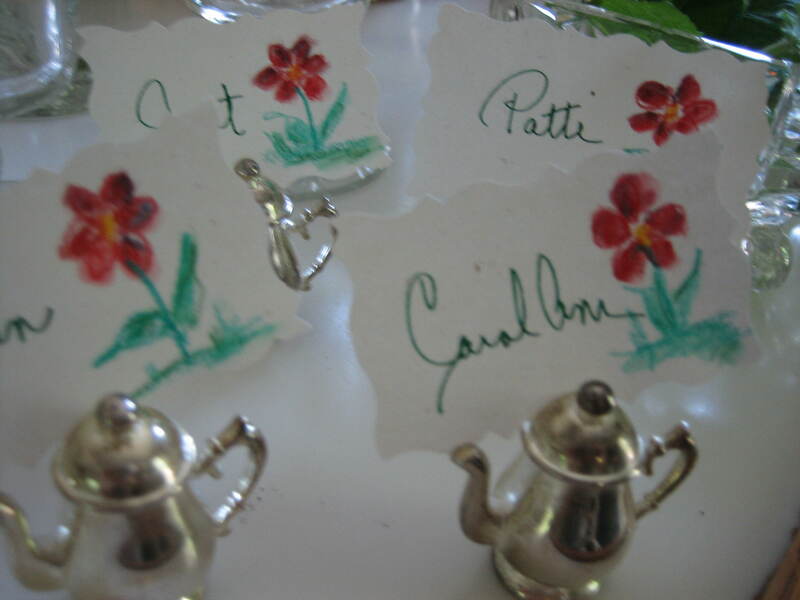 I also enjoyed a little art play by creating place cards for each guest which would be set into these cute little silver tea pots at each guest’s place. Everything was now ready except for me. Time to dress and make myself presentable. 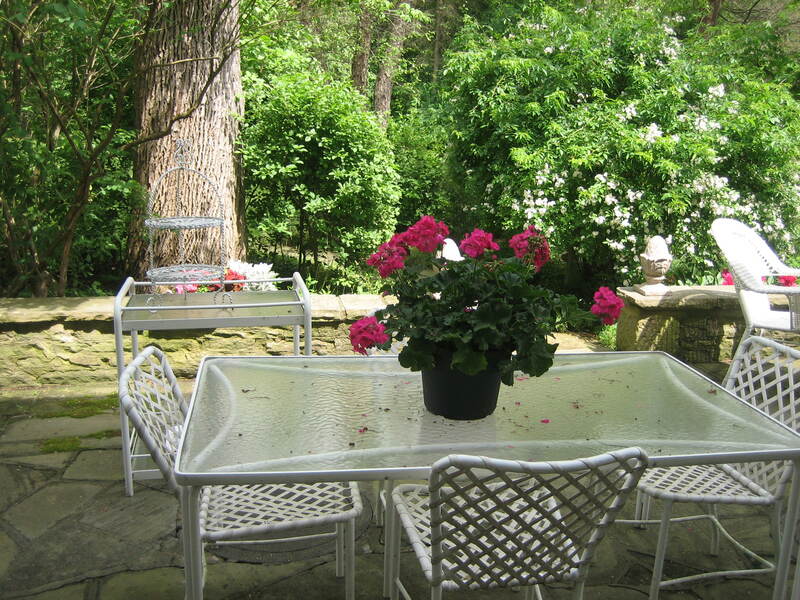 It was also time to walk through the house and do a little fluffing and polishing, but not too much because my guests and I would be outside on this beautiful day. At the appointed hour I carried all the ingredients out to the patio. 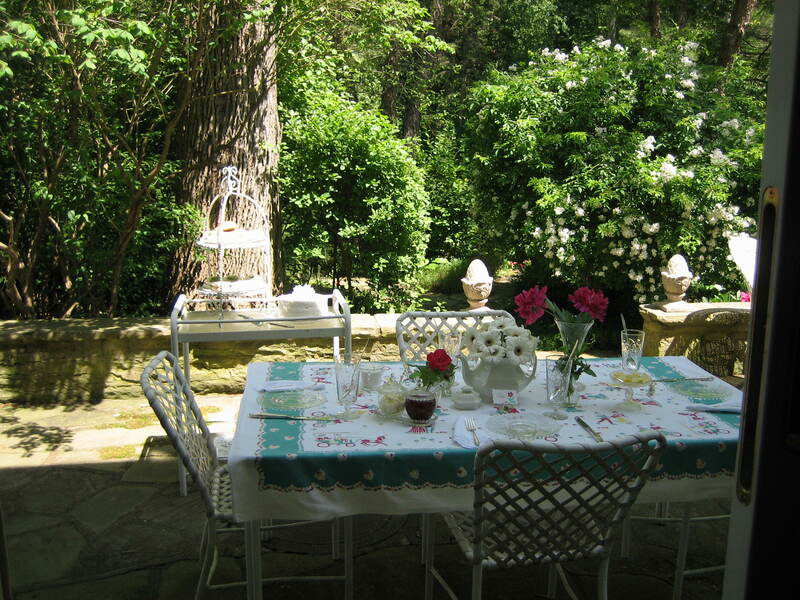 The potted geranium was removed and set at another location, and the tablecloth came out. I’ve been collecting vintage tablecloths for years. They make a table look so happy. We may not be ladies of leisure all the time, but this afternoon that’s exactly what we were! We sipped, we munched, we chatted, we breathed in fresh air and enjoyed the sweet sound of birdies and the scent of old roses. Was this heaven? It was heaven to me! I hope it was heaven to my guests too. Come, come, come to the garden! Another beautiful time at your home!! You really do make it look all so easy. 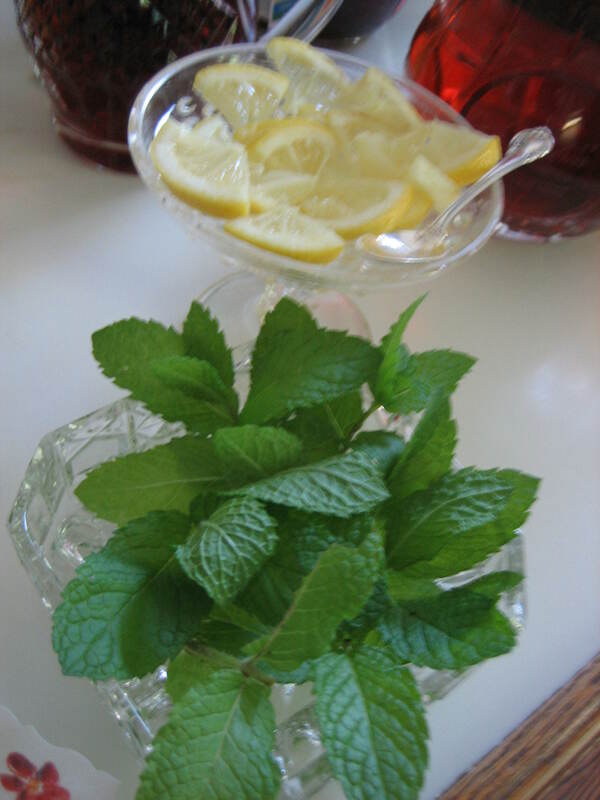 Reading your blog is like reading a portion of a beautiful tea book!! I bet Emilie Barnes and/or Sandy Clough might print this in one of their books!! Or better yet, why don’t you do a tea book and a letter writing book?? What a lovely time it was,,,,thank you, Carol. I’m so glad you could come. I had fun too! Thank you for the kind words. I have so much fun and sharing makes it better yet! You and I think alike. The letter writing book is already written and I do plan to whip up a tea book one of these days. 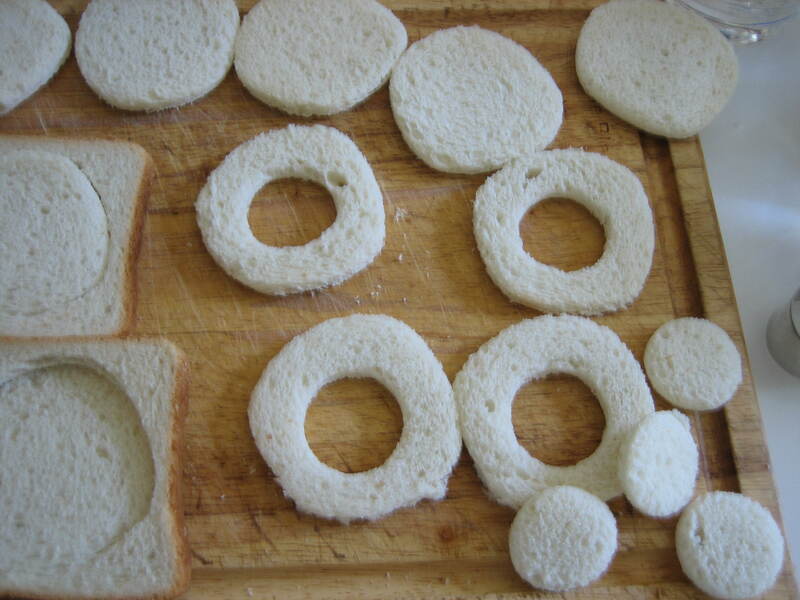 I don’t know what’s more fun more fun – doing these these things or sitting back, with feet up, writing about them. 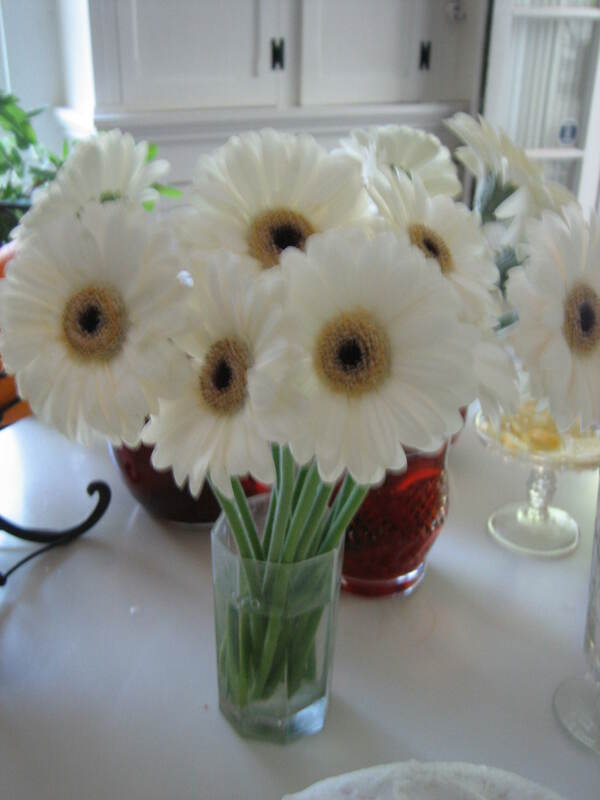 Nice blogs Carol…we especially liked the one about your doggie! Staying VERY busy here….here’s the way my week started off…..a gentleman….55yo….who used to sit behind me when I attended the Sat. 5 p.m. Mass…..but sat 6 rows in back of me last Sun. at the 8 p.m. Mass…..collapsed as we were saying the Gloria ( no music at this Mass)….I sit about 10 rows from front in middle of church….few older people up front, no kids…..anyway, a group tried to resuscitate him to no avail….as he lay in middle aisle amongst beautiful stain glass windows and a gorgeous sunny morn…..with the priest at the altar, and the altar’s huge crucifix looming down at him…..the priest left the altar and anointed him….then the EMS carried him away……his funeral Mass was a couple days later!! It was the most incredulous event I have ever witnessed in a church…..after he was taken out of the church….the Mass resumed without missing a beat!! He wasn’t married ….and his girlfriend wasn’t there …..I will think of that event every time I’m in that church!! But…..what a way to go….a couple other interesting events happening, but that was the highlight of the week for me. 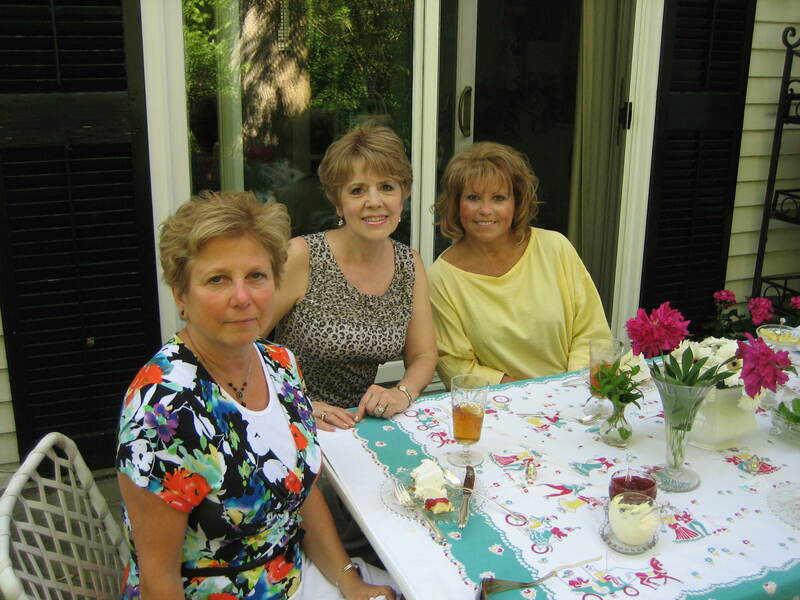 Terri is still eating and doing OK….heat wave coming this way next two days, but I’m lovin it, Later, Mary. P.S. He did die from a heart attack and not a brain aneurysm. Nice to see you on my blog. Doggie Alex says hi to Doggie Terri. I wonder which dog is more spoiled. And what a story you had for me! I thought you being a nurse, you were going to save that man who had the heart attack. Well, as you say, Church is the place to die I guess – maybe straight to heaven for him. You’re sweet. What I should do is write you a letter and I intend to do just that — very very soon.